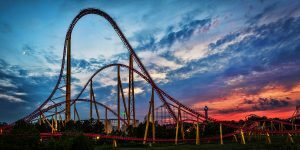 Check Out What's New At Cedar Point! 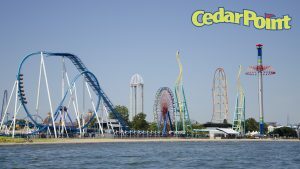 Check Out What’s New At Cedar Point! Looking for something to do this summer? Cedar Point just began its 2017 season with new attractions, restaurants and shows. Enjoy rides this Friday, May 12th or any day through September 4. It’s open weekends after that through October 29th. During June 9th – Sept 4th, the Iron dragon will become a virtual reality. Guests 13 and older will be able to ride the coaster while wearing a virtual reality headset. The old wooden coaster, Mean Streak, gave its final ride last September but the park plans to re-purpose this classic attraction. Cedar Point plans to keep the classic wood supports and add a wood-steel combination track built by Rocky Mountain Construction. The RipCord has a new name and a new location as well. It is now called Professor Delbert’s Frontier Fling and will be in Frontier Town. Cedar Point has added four new restaurants and a new season pass drink plan. A popular restaurant in Ohio, Root’s, offers shredded chicken, pork and beef sandwiches. Similarly, Famous Dave’s BBQ has been opened on the Frontier Trail. An Ohio favorite, Melt Bar & Grilled takes grilled cheese to the extreme. It will feature a full-service bar and a sandwich exclusive to Cedar Point. In Frontier Town, Wagon Wheel Pizza will serve handmade pizza to hungry customers. Cedar Point has also implemented a new season drink pass that gives the option of choosing a refillable drink bottle or disposable cup at the beverage stations for unlimited fountain drinks all summer. One of the big new attractions at the water park is Point Plummet, the six-story-tall, four-person aqua-drop body slide that will send four people on a nearly vertical free fall when the floor drops out from under them. The four separate 400-foot-long slides will send riders through a series of loops and s-curves. The waterpark will also feature a new attraction, Storm Surge. This takes riders down a slide on a large raft 76 feet above ground. For adults, Cedar Point has added a few new bars to the waterpark. They have added Muffleheads Beach Bar which is a swim-up bar. Schooners Beach bar is also new and is located next to Breakwater Bay wave pool. It will feature signature cocktails and beverages with live entertainment. Cedar Point Shores is scheduled to open on Saturday, May 27, 2017 with a special preview day for all Season Passholders on Friday, May 26. Cedar Point just added metal detectors so be prepared to be waiting a few minutes while entering the park. 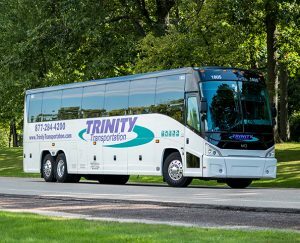 Trinity Transportation’s Cedar Point Line Run will return on June 17th. You can purchase a park ticket and transportation for only $79!! For more information, click here!